How much will my class ring cost? Zachary's is the alternative choice offered by the U.S. 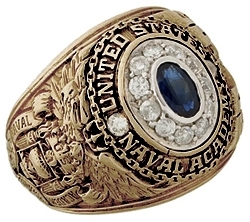 Naval Academy for your class ring gemstone purchase. A local jeweler skilled in providing and setting quality gemstones for over three decades, Zachary's is located just around the corner. Our staff is available to answer all of your questions about your class ring purchase every day of the year. 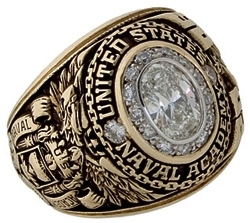 Compare price, quality and our custom-designed gemstone clusters and see why Zachary's Jewelers of Annapolis has been the #1 alternative choice for USNA class ring gemstones. Zachary's Jewelers uses natural, genuine gemstones, cut to enhance color and brilliance. Select your actual gemstone and ring design with diamond clusters and dividers to enhance the center stone. Zachary's Jewelers custom designs every diamond and/or gemstone cluster to perfectly enhance your selected center stone. Because we do not use a template, our diamonds are set intricately and close together, resulting in the most beautiful original treatment. *Offer valid for purchases over $200. Zachary's Jewelers is the largest supplier of diamonds to the U.S. Naval Academy. We are the area's only diamond importer and maintain the largest inventory of loose certified stones. Because we import our diamonds directly, we can offer the best prices. Furthermore, because of the strong relationship developed through many years of service to the U.S. Naval Academy, we always offer the lowest prices possible to the midshipmen to show our thanks for your support and commitment. Zachary's Jewelers continues to sell more diamond engagement rings to the midshipmen than any other jeweler in Annapolis. Skip the lines... Purchase Select Gemstones Online. Learn more about Star Sapphires. What makes a beautiful Cluster?